Sandy Hester isn't sure who the stranger was who used a white pickup to drive her Arabian horses away from the fire, but she appreciates the help. Photo by Peter Williams. Sandy and Gord Hester face the daunting task of rebuilding their world-class horse training facility destroyed Wednesday in a raging prairie fire. The Hesters can take some solace, though, knowing they won’t have to go it alone. “The support is unbelievable,” Sandy Hester said Friday. The riding arena, stables, paddocks and pasture at S.R. Training were destroyed by the fire. 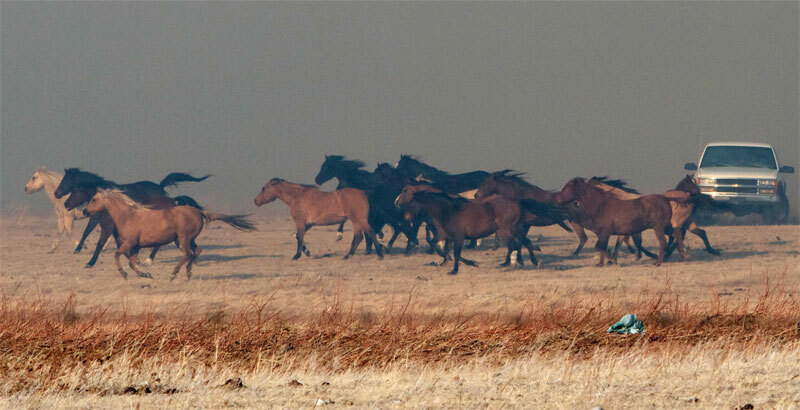 The immediate challenge facing the Hesters is to find long-term accommodation and feed for the 55 horses displaced by the fire. In the short term the Hesters would benefit from donations of quality hay, such as second cut alfalfa with no rain. Cash donations are also needed to buy hay and feed and working supplies for the horses. Donations of equipment such as halters, shanks, working saddles, blankets and buckets are also welcome. Fence panels for temporary corrals are also needed. Cash donations can be made at the CIBC branch in Fort Macleod to an account in the name of Sandy and Gord Hester or Friends of S.R. Training, or at the Fort Macleod Vet Clinic. At present some of S.R. Training’s client horses are boarded at Kerry Miller’s M&M Farms. To drop off donations of hay take Highway 811 to Township Road 100 and head west for 1 1/2 miles, looking for the yard with the big red barn and quonset. Inquiries about providing help can be directed to Sandy Hester at 403-331-8440 or Gord Hester at 403-394-4255. Gibson said it is unknown how much of the arena and stables will be covered by insurance. Sandy Hester was in Fort Macleod when she got a phone call about 11:45 a.m. Wednesday that the fire was heading to her place. By the time she got home her staff had halters on the horses and people were already arriving with trailers to take the animals to safety. Connie Hunter had been tasked to phone people to help get the horses to safety. Thirty-four horses were loaded into trailers and barbed wire fences were cut so 19 other horses could escape on their own. They were rounded up Thursday close to Head-Smashed-In Buffalo Jump. Gord Hester stayed behind, using heavy machinery to keep the fire from their house. “If he hadn’t stayed we would have lost everything,” Sandy Hester said. In addition to the facilities and equipment needed to run her business, Sandy Hester also lost 30 years worth of memories in photos and other mementos in her office, which was in the riding arena. The future of the business, and its four employees, is not clear. It will take months to settle insurance claims, and rebuilding will not be easy. Volunteers were at the property on the weekend helping rebuild fences, and donations of cash and support were already forthcoming.